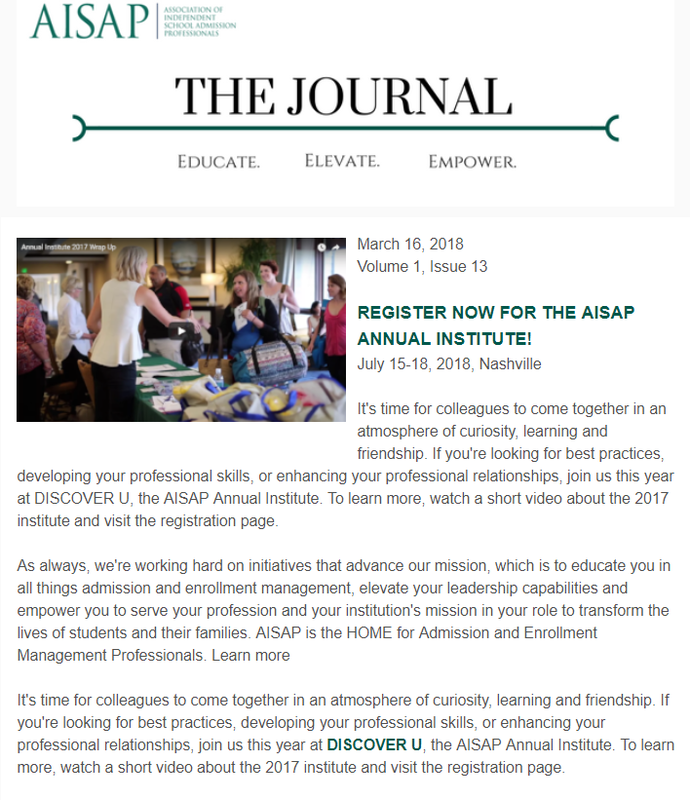 The Journal is the industry’s leading e-magazine. 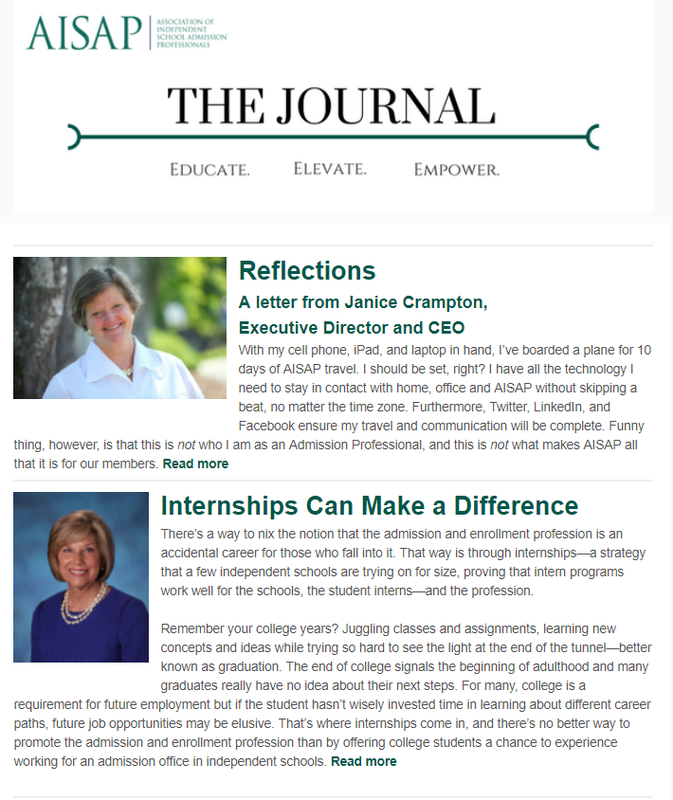 Produced every two weeks, the Journal is a deep dive into all things admission and enrollment. 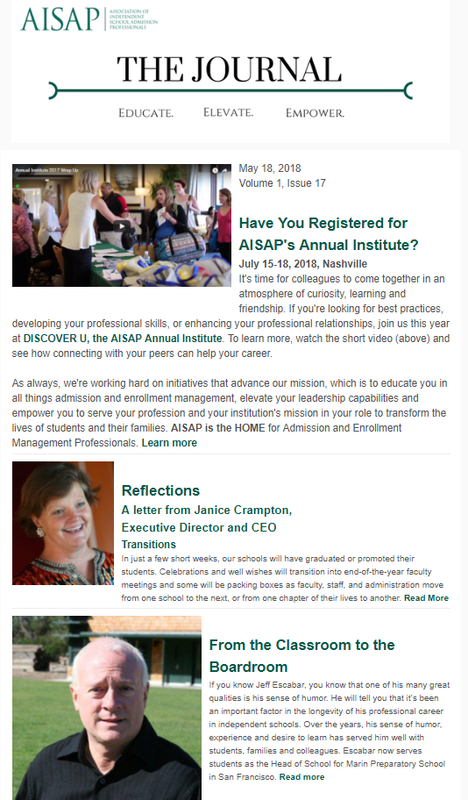 Take a look at the latest edition and enjoy browsing the archives. 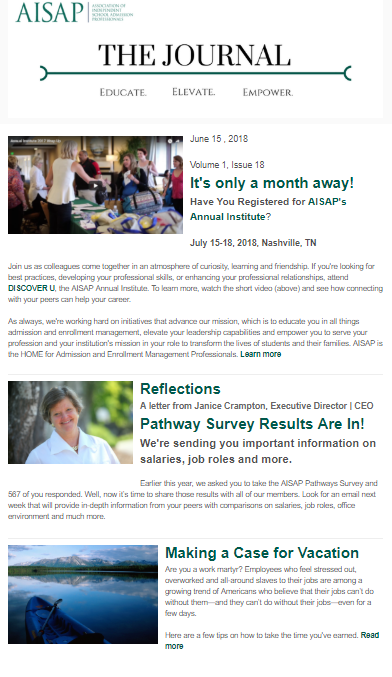 Reflections: "Pathways Survey Results Are In!" 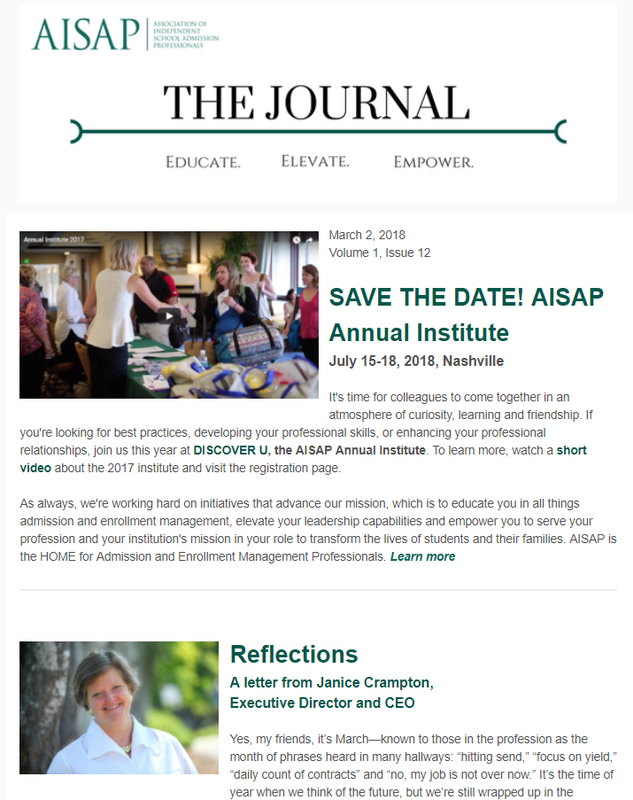 Feature: "Making a Case for Vacation"
Profile: "The Story of YOU"
Insights: "More Than a Feeling: Connecting Data, Gut and Action in Admissions." Profile: Jeff Escabar - "From the Classroom to the Boardroom"
Insights: Register for three upcoming webinars! 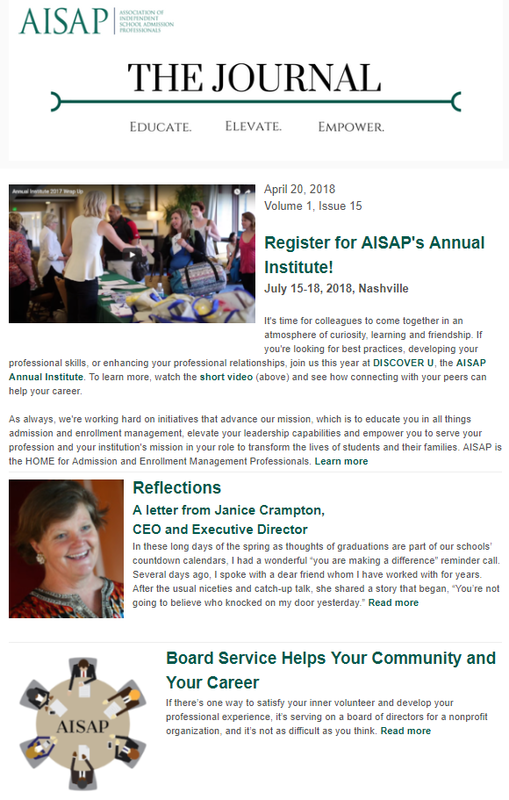 Reflections: "A special InspirEd podcast with Janice Crampton"
Feature: "The Power of Taking Risks"
Profile: G. Bryan Fleming - "Asking the Important Questions"
Events: Last Call to Save on AISAP's Annual Institute! 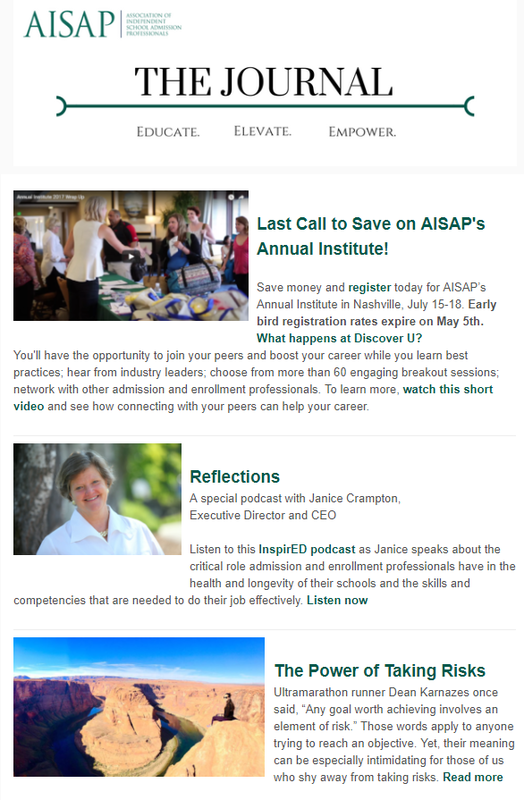 Reflections: "He Got Off the Merritt Parkway"
Feature: "Board Service Helps Your Community and Your Career"
Profile: Karen Fisher - "Creating a Culture of Service"
Events: Register NOW for the Annual Institute! Profile: Pam Dreisin - "The Real Deal"
Feature: "Life Habits Help Your Career"
Profile: Nicholas Blaikie-Puk - "On the Road Again"
Insights: "Gentle Landings: Promoting and Presenting your Second Visit Program"
Profile: Chris Baker - "Leading the Way"
Events: Save the Date for Annual Institute!